If there is a more exciting and fun way to catch summer bass than with topwater baits such as a popper or frog, than I don’t know what it is. Last weekend, while fishing a weedy, shallow lake in Wisconsin that regularly puts out nice-sized bass, we came up to a spot that normally is very clear. This night however found us with lots of weeds that were grown all the way to the surface of the water, leaving us with not a whole lot of choices for baits. We decided to use topwater poppers and the fun that ensued kept us busy all night. While we didn’t land anything larger than a 12-inch Largemouth, we did boat over 15 bass in an hour and had a blast. There are a few simple things that you can do to catch more big bass this summer with topwater baits. Big bass hang out along the edge of the weeds off the shoreline in small waterways and this is typically where you can get a frog or topwater to work. Cast along the shoreline, maybe 4 or 5 feet off depending on the lake depth and slowly pop the bait back to you. Make sure to pause a second or two in between pops to give the fish a chance to hit it. In between large weed patches is another great place to find fish. If you cast in between these sections and slowly pop the bait back to you, you’re sure to catch some bass. Big topwater poppers are usually the norm, but we found that using smaller ones produced more fish. While casting the small poppers, we had hits all across the board and the fish wouldn’t let it past them. Bigger isn’t always better. When that lunker bass hits your topwater popper be sure to set the hook right away and hold on. 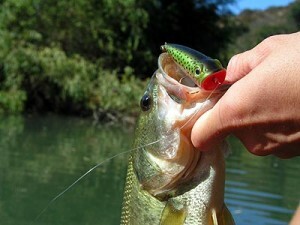 You’re going to have a great time reeling in largemouth bass and who knows? 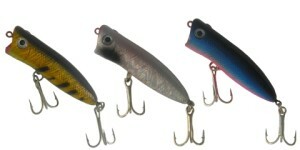 Maybe a big northern when you use Topwater poppers for big bass this summer.